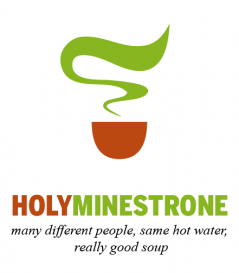 I just want to share a recipe of a beautiful minestrone that I’ve tasted. When you’re involved in deep, rich community of the Lord Jesus, the relationships are so good, you don’t “need” Facebook. It’s too superficial and woefully artificial. Why trade-out the real thing? At the same time, FB can become a useful tool for simple group organization and a type of “global phonebook.” However, it is not the “go to place” for tasting rich community. There is a subtle temptation to make it a substitute for the effort of the true face-time that community requires. But we don’t need FB (or similar) for that.I think we just give away too much if we substitute social media for the frequency of seeing each other. Social media can help our deep connections, not furnish them. We already have the One — who reveals his face to us — in the Book. He also shows us how much he “likes” us through our church family. And to that, we say, “Basta” in Italiano. Love the title of this one. Love the allowance of social media while recognizing that we treat it as though we need it on one side, or as though it is useless and terrible on the other.I whole heartedly agree with this. I think the case (or warning) can be made that people often use social media (especially FB) as a substitute for genuine community. Real community takes face-time and some work is involved. Sometimes it’s hard work, and social media removes both the work AND the authenticity of presence. It’s a myth to have community through social media, but it’s attractive to try and many people do. AMEN! Loved this post… or whatever you call it on a blog… you are my first blog that I follow! 🙂 Have really enjoyed it… I finally subscribed to Email updates… I was missing some on the FB connection! This is better! 🙂 Way to go, Robby! Or better yet, way to go GOD for using your Robby! Hugs, Bro! Thanks J for the encouragement! It helps to keep me going knowing that each post and article touches different people all over the globe – but especially to encourage friends that are ministering in different places. Keep sharing your insights and feedback when you have the opportunities to comment. Thanks again.